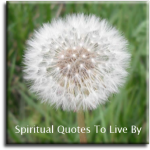 The quotes on this page are all from sources and authors with surnames beginning with K through to N.
It's no possible to have a problem without believing a prior thought. To notice this simple truth is the beginning of peace. Alter your thoughts and you alter your world. Happiness is a choice we make. You can wake up and say, ‘Oh, I can’t believe it’s so cold,’ or you can say, ‘Oh, wow, this is a great opportunity for me to try out my new sweater.’ No one can be consistently positive, but why not make the choice that makes you feel better than the one that drags you down? In being love.. I give love. In being joy.. I give joy. In being happiness.. I give happiness. Everything I need is within. Knowing yourself and coming to trust your feelings and your intuition will open up your life to greater possibilities and keep you moving toward your goals. One thing I have learned is that I should trust my ‘gut’ instincts. Ultimately, only we know what is best for us. Life excites me. I am passionate about my goals and excited by the opportunities the Universe provides. My ambition comes from my passion, finding what I love and then expanding on that. You should always be aware that your head creates your world. Creativity is harnessing universality and making it flow through your eyes. It’s best to leap into something you know and love. You might change your mind later, but that is the privilege of youth. All people dream, but not equally. Those who dream by night in the dusty recesses of their mind, wake in the morning to find that it was vanity. But the dreamers of the day are dangerous people. For they dream their dreams with open eyes, and make them come true. Words are but the shining garments of thought. Nothing under the sun is accidental, least of all that of which the intention is so clearly evident. The more we see the more we must be able to imagine, and the more we imagine, the more we must think we see. To look forward to pleasure, is also a pleasure. You can have anything you want, providing you first let go of wanting it. Do not waste time bothering whether you 'love' your neighbour; act as if you did. As soon as we do this we find one of the great secrets. When you are behaving as if you love someone, you will presently come to love him. You can have anything you want if you want it badly enough. You can be anything you want to be, do anything you set out to accomplish, if you hold that desire with singleness of purpose. Beliefs and thoughts alter cells in your body. 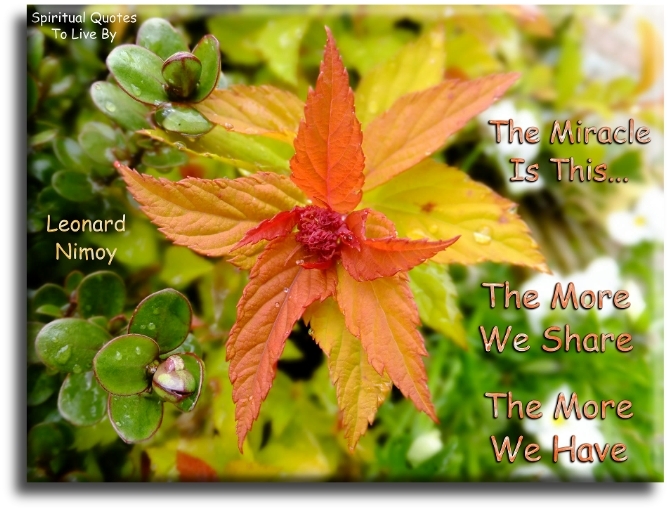 The moment you change your perception, is the moment you re-write the chemistry of your body. Through consciousness, our minds have the power to change our planet and ourselves. Your biology is a reflection of your perception. Do what you can do. As well as you can do it, every day of your life and you will end up dying one of the happiest individuals that had ever died. The World is... as You Are. It doesn't matter if they say you can't do it... It only matters if you say you can't. Surrounding yourself with creative, imaginative people is a good strategy for success whether you're an entrepreneur seeking innovation or an artist looking for inspiration. If people understood what they're really capable of, we could transform our societies almost overnight. Past and future are in the mind only. I am now. Within you right now is the power to do things you never dreamed possible. This power becomes available to you as soon as you can change your beliefs. Every time we say ‘Let there be’ in any form, something happens. 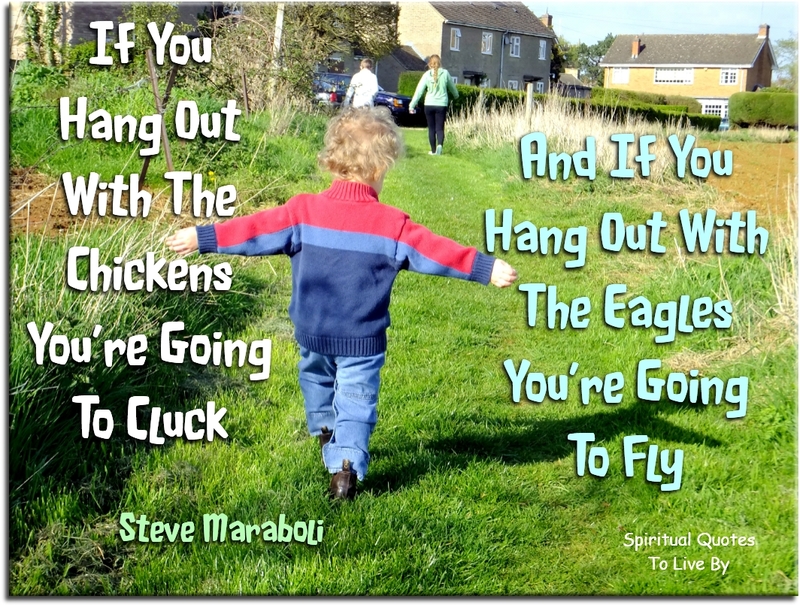 If you hang out with the chickens, you're going to cluck and if you hang out with the eagles, you're going to fly. Every day is a day to be thankful. Life’s abundance has no limit, and gratitude is what keeps abundance flowing. In every circumstance there is something for which to be thankful. Even when there seems to be nothing else, there is hope. It's no use crying over spilt milk, because all the forces of the universe were bent on spilling it. We had better want the consequences of what we believe or disbelieve, because the consequences will come! What we insistently desire, over time, is what we become. 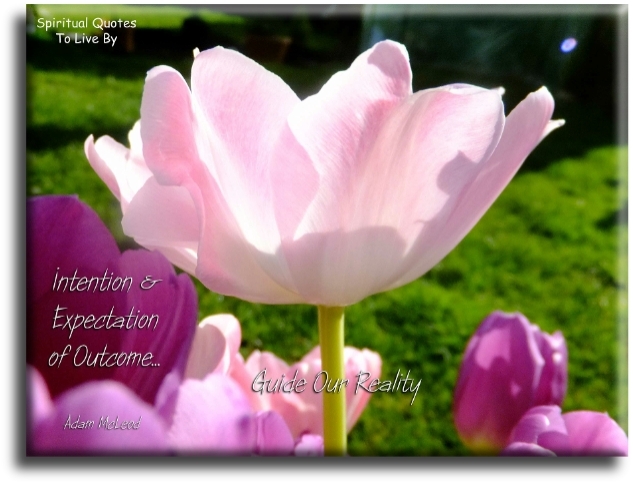 Intention and expectation of outcome guide our reality. Our consciousness, as energy, appears to generate spontaneous 'thought links' to the field. The only limits that you have are the limits which you have set for yourself in your own mind. What we learn with pleasure.. We never forget. The gift of love is the gift of the power and capacity to love, and therefore, to give love with full effect is also to receive it. So love can only be kept by being given away, and it can only be given perfectly when it is also received. Nine-tenths of our sickness can be prevented by right thinking, plus right hygiene. The moment one gives close attention to anything, it becomes a mysterious, awesome, indescribably magnificent world in itself. Our attitude toward life... determines life's attitude towards us. 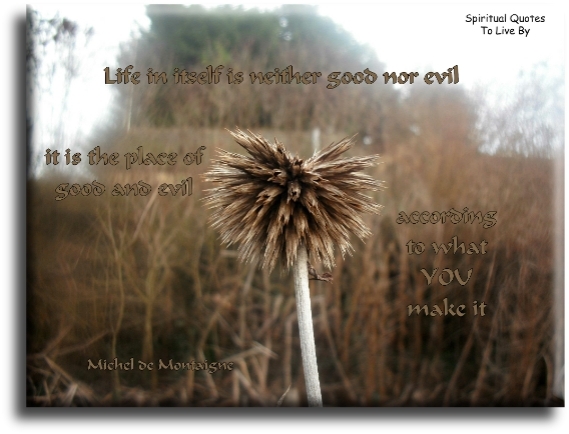 Life in itself is neither good nor evil, it is the place of good and evil, according to what you make it. Not being able to govern events... I govern myself. 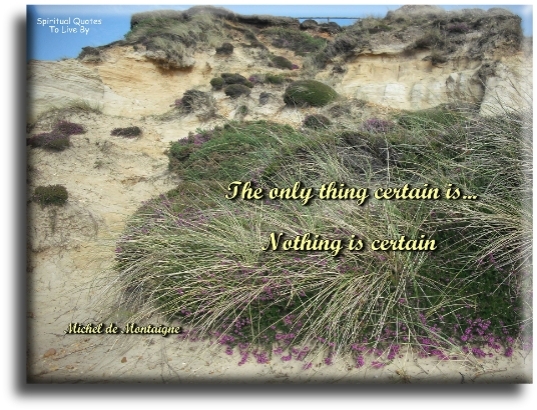 The only thing certain is... nothing is certain. Whether the events in our life are good or bad, greatly depends on the way we perceive them. I said I would get better with each baby.. And I have. Once you start believing that something is possible, you start to let it in to your awareness and it starts to become true to you. Whatever you believe, you will find that you are correct. The Universe has a way of presenting to you exactly what you believe. When I was willing to let go of what I wanted, I received what was truly mine. I've realized the latter is always the greater gift. I see the world at peace. If we can hold that thought, that thought has a power. The thought is witnessing a reality of peace in the world. By witnessing the possibility that it can take place and holding it in my consciousness, then that becomes something that is transmitting into the world. It's like a seed of peace that I'm planting from my consciousness into the world. The best choices will always be the most loving. If someone prays for patience, you think God gives them patience? Or does God give them the opportunity to be patient? If a person prayed for courage, does God give him courage or does God give them opportunities to be courageous? A free man is someone who is true to himself. Who follows his dreams and turns them into reality. You have to put fear to one side, it will always be there, but you have to follow your path. It’s all possible if you put enough energy into it. A free man, to me, is someone who tries to make his dreams come true. The limits are only what you can imagine. You must learn to focus your will and create what you see in your mind. Love is an element which though physically unseen is as real as air or water. It is an acting, living, moving force... it moves in waves and currents like those of the ocean. There is a supreme power and ruling force which pervades and rules the boundless Universe. You are a part of this power. I am as great as the thoughts I conceive. I am as great as the Universe I perceive. I am as great as the love of my heart. I am as great as the God in my Soul. Never get weary of giving and you will never cease receiving. Think with your heart. See with your heart. Hear with your heart. Feel with your heart. Act with your heart. Speak with your heart. For love is the highest, most powerful, durable human capacity. What the people believe.. is true. If you are doing things in order to be happy... you're doing them in the wrong order. Inner success is the ongoing experience of love, happiness, fulfillment and well-being... the experience of joy in your everyday life. The only reason why you are ever unhappy is... because you think you should be. The Universe runs on a fundamental and oh-so-wonderful principle... when you get really clear and honest about what you want, everything in the Universe conspires to help you get it. It's choice, not chance... that determines your destiny. The miracle is this... the more we share, the more we have. If you want to have world peace - peace in your family, peace in your town and peace in your own bedroom - you simply begin with whatever creates peace within yourself. This vibration will go out from you in waves, and these waves have a very positive impact on the world. My body and its condition are a barometer that is always trying to tell me which direction to go for my maximum creativity, health and fulfillment. And, because I'm human, I get off track now and again but I can always get back on.